We would like to dedicate this paper to the memories of Michael Corbett and Martin Naughton. Michael used assistive technology daily including a mouth stick and text reader. Michael and Martin were both advocates for human rights and lifelong campaigners for people with disabilities to achieve real freedom. A society where everyone with a disability or disabling condition, and older people, has access to affordable, up to date and appropriate technology that suits their needs. Technology may be mainstream or specialised, it supports the individual to exercise their human right to self-determination, freedom of movement and participation in society. Chapter 2. Why do we need to focus on Assistive Technology? Chapter 3. How can Assistive Technology support people in their lives? Assistive Technology can support us here in Ireland to realise the ambition that we have to include people with disabilities in all aspects of living, in line with the ambition of the United Nations Convention on the Rights of Persons with Disabilities (UNCRPD). For people with disabilities and older people, technology can change the most ordinary of daily activities from the impossible to the possible. Assistive Technology can support people to live to their fullest, to participate in education and employment and to live independently and as part of their communities. Changing demographics and technological developments incentivise a more coherent policy approach to the delivery of Assistive Technology. People with disabilities and older people are the experts of their own lives and they need to be resourced. The Assistive Technology Passport proposed in this paper is a record of an individual Assistive Technology user's equipment, training and funding history. It is owned by the person and offers them autonomy over their Assistive Technology needs. It can travel with the person, across school, college and work. It can allow them to have freedom of movement throughout the country on a par with everyone else without fear of losing funding, IT supports or training on the Assistive Technology they use. The Disability Federation of Ireland (DFI) is very pleased to have developed a strong collaborative partnership with Enable Ireland, to chart a way forward. Particular thanks go to Siobhán Long from Enable Ireland as well as Joan O’Donnell and Pierce Richardson in DFI who compiled this report. I also wish to thank all those who gave so generously of their story, who have spoken out about the liberating effect Assistive Technology has had on their lives. Finally I call on my colleagues in the Oireachtas, policymakers and services in the community, to engage in discussion and action on how we can transform people’s lives for the better, through effective and appropriate policy and practice measures using Assistive Technology. Assistive Technology is a key that can unlock so many possibilities for people with disabilities and older people. Whether it’s a school-child using literacy support software, a young woman using her eyes to access a communication device or an employee using a touchscreen tablet to manage everything from emails to accounts, I have seen the transformative effect that Assistive Technology has on people’s lives. I am excited about the AT Passport proposed here. It has the potential to streamline the way in which people gain access to Assistive Technologies, when and where they need them. The AT Passport is the foundation upon which we can build a comprehensive Assistive Technology ecosystem of supports, from quality information provision to assessment, provision of technologies and training support. The partnership between Enable Ireland and the Disability Federation of Ireland which has resulted in the publication of this discussion paper is one which I value highly. The contributions of Joan O’Donnell and Pierce Richardson of DFI, alongside Siobhán Long of Enable Ireland, have given us a firm foundation on which to build further discussion. This paper proposes a clear way forward. Enable Ireland is committed to being part of this conversation. Together we can work to ensure that those who need Assistive Technology can get it – and as a result, experience greater autonomy in their own lives. The population of people with disabilities and older people is growing and technology is also developing at a great speed. Assistive technology, when used appropriately, has the potential to support people with disabilities and older people to exercise their human rights and become more active members of society. The Disability Federation of Ireland and Enable Ireland share a concern that current service provision for Assistive Technology is fragmented and under-resourced to meet these emerging changes. We have produced this paper to prompt discussion and action on a more comprehensive Assistive Technology service. We lay out both immediate and longer term recommendations to ensure the inclusion of people with disabilities and older people in Irish society. Assistive Technology refers to practical tools that enhance independence for people with disabilities and older people. It is “any item, piece of equipment or product system whether acquired commercially, modified or customized that is used to increase, maintain or improve functional capabilities of individuals with disabilities” (World Health Organisation & World Bank 2011, p.101). Why do we need to focus on Assistive Technology? Ireland has an underdeveloped Assistive Technology infrastructure in comparison with other countries such as Norway, Denmark, the Netherlands, and Germany (NDA 2012). Here in Ireland, services are fragmented and inconsistent. Services are not designed to be user focused. The current spend on Assistive Technology is unquantifiable, but estimates suggest it is insufficient to meet need and does not represent sound value for money. The effectiveness of current interventions is also unknown. An appropriate and effective Assistive Technology service could provide a significant return on investment for both the State and the Assistive Technology user. It could also help to address gaps in the implementation of many government policies that aim to support citizens to participate fully in Irish society. We recommend the introduction of an Assistive Technology (AT) Passport as a central connector for a comprehensive ecosystem of supports. It can place people with disabilities and older people at the centre of articulating and driving their Assistive Technology needs. It can act as a record of a person’s Assistive Technology usage, training and IT support needs as well as funding history. This requires an infrastructure that complements existing service provision, as well as information provision, training and the promotion of innovation. The recommendations made here are based on desk research, interviews, case studies and discussions with stakeholders and a survey of Assistive Technology users. We have also taken guidance from international best practice (Eastin 2012, NDIA 2015). Issue a policy statement to guide the development of a comprehensive ecosystem of supports for Assistive Technology including making provision for an AT Passport. The policy statement can set out principles by which a service can be developed. These include an accessible, consumer-focused and flexible service. The policy statement can prioritise value for money, and central procurement. It can also stipulate that Assistive Technology must improve people’s lives and be sustainable. Such as statement requires ministerial support, where it can cross government departments and be stitched into wider systems of service delivery. Introduce an Assistive Technology (AT) Passport that can act as a single resource to support Assistive Technology users to access the training and supports people need. The AT Passport can also provide a record of Assistive Technology use and act as a record of funding. This record is held and owned by the Assistive Technology user. A central agency needs to hold responsibility for coordinating different aspects of a comprehensive service. These different responsibilities form an ecosystem of supports including issuing of AT passports and central procurement functions. The central agency also works alongside information provision, service delivery, training and innovation to ensure that services are as up to date and responsive as possible (see Figure 1). Develop the existing online information resource to respond to emerging technological developments and support interactive online forums and peer learning. A web based resource could also support training and form the basis for the development of a loan library to trial different Assistive Technology. The Community Hub For Assistive Technology (CHAT), a national network of AT users, AT service providers, researchers and innovators, could also act as a model for information exchange and shared learning. Eligibility criteria must be established to respond to both the person's financial means and complexity of Assistive Technology solutions. Assistive Technology may be too expensive for the individual to bear, beyond a specified threshold of reasonable cost. Funding must be based on income and need regardless of the purpose for which the technology is used. Many Assistive Technology needs can be met by off-the-shelf items such as handheld devices. Complex needs may include more expensive items such as eye gaze systems or highly individualised custom made solutions. Central procurement can offer the best value for money for commonly used technology. Procurement could be coordinated across government departments by the central coordinating agency. We require a more comprehensive model for service provision. We considered many international models and experiences in other countries, including the UK, Australia and the US. 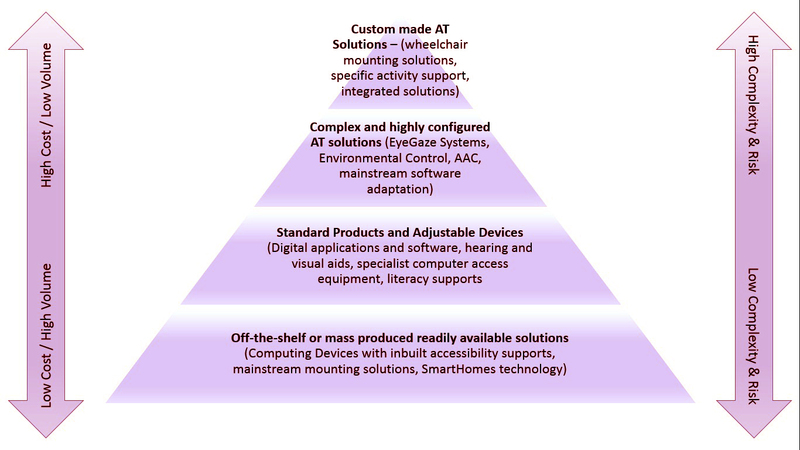 This model is largely informed by the joint European Assistive Technology Information Network model (EASTIN 2012) and the Association for the Advancement of Assistive Technology in Europe (AAATE) position which sets out seven steps to service delivery. The seven steps are set out in Figure 2 and include referral and establishment of eligibility for funding. The applicant is then assessed and time is taken to select the most appropriate solution, before that solution is chosen, implemented and a process for follow up is put in place. Technology is developing rapidly and its future potential is unknown. People with disabilities and older people need to be resourced to articulate their needs, and influence future design and development of technology. AT users must also have the opportunity to train and peer mentor each other. Competence amongst service providers also needs investment. This involves the development of a national framework along with Accredited Continuing Professional Development programmes. User-centred research in technology design underpinned by the principles of Universal Design also needs to be considered to ensure future technological developments are accessible. ● Resourcing CHAT, as a cross-sectoral learning hub that supports multi-stakeholder engagement and learning. Technological supports can liberate people to communicate with others, to live independently, as well as live and work in their communities. Accessible mainstream technology and Assistive Technology together form the new pen and paper of the 21st century. We now have a unique opportunity to bring the UNCRPD to life using Assistive Technology. This is not an opportunity we as a society can afford to miss. Technology and society are locked in a two way exchange with technology exerting a huge influence over the ways in which we live. Every aspect of social, political, economic and cultural life is now influenced by technology. This offers a unique opportunity for people with disabilities and older people to participate in Irish society as never before. It supports a human rights agenda and makes sound financial sense. We should build a sustainable ecosystem for accessible technology in Ireland, which empowers everyone to participate. This ecosystem can generate social and economic value to the Assistive Technology user and to society. This paper defines what we mean when we talk about Assistive Technology, and the impact it can have on people’s lives. We introduce the concept of an Assistive Technology (AT) Passport that can place people with disabilities and older people at the centre of articulating and driving their Assistive Technology needs. The AT Passport is a new concept which has the potential to complement current service delivery models. We propose this unique solution along with a supporting infrastructure in order to bring greater coherence and cost effectiveness to Assistive Technology service provision in Ireland. This paper also calls for a whole of government policy statement to support the AT passport and sets out principles that will deliver better and more strategic outcomes for people with disabilities and older people. “any item, piece of equipment or product system whether acquired commercially, modified or customized that is used to increase, maintain or improve functional capabilities of individuals with disabilities” (World Health Organisation & World Bank 2011, p.101). Examples of Assistive Technology include screen reading software that supports people with vision impairment as well as those with literacy challenges, and voice output communication solutions for those who are non-speaking. It also embraces environmental control technologies such as remote control of doors, windows and lights to enable independence in the home. On top of that there is a growing range of mainstream mobile solutions available via apps on smartphones and tablet devices which can support everything from personal navigation to personal organisation and memory aids. This paper makes a distinction between Aids and Appliances, which includes hearing aids and mobility aids and Assistive Technology which refers to electronic devices. We also note a difference between Assistive Technology and technology enabled care services e.g. telehealth, telecare, ehealth and digital health (healthcare at a distance). Many mainstream developments in technology such as smart phones and tablets offer excellent accessibility features. Often these are enough to support a person, but the user may need opportunities to trial different options before buying. As the pace of change is so fast, we should act now to ensure that we support a society that expects all mainstream technology developments (from public services to websites and apps) to be accessible, and that we design services to provide supports to those who need them in a timely and efficient way. Smartphones and tablets have become increasingly accessible and affordable in recent years. There is a growing trend to offer more free content online, much of which is accessible to disabled and older people. It is now possible to provide remote online technical support, which offers great opportunities to remotely support people to use technology, and can also be used for peer mentoring. Wearable technology can provide alerts and information in more accessible ways. For example an alert could remind someone to take medication or to leave home at a particular time to catch a bus. The Internet of Things (IoT) describes the networks between physical devices and buildings that allows those objects to collect and exchange data. This can perform tasks such as monitoring what food needs to be reordered online and requesting supermarket deliveries. The advent of new ways of delivering services, such as AirBnB for accommodation and Hailo for taxis, are based on the concept of a sharing economy, and are revolutionising how we access goods and services. Potential developments of interest might include accessible online accommodation booking services to meet significant shortfalls in respite, residential and holiday accommodation. Ireland has an underdeveloped national Assistive Technology system in comparison with other countries, such as Norway, Denmark, the Netherlands, and Germany (NDA, 2012). An appropriate and effective Assistive Technology service could provide a significant return on investment for both the State and the Assistive Technology user. It could also help to address gaps in the implementation of many government policies that aim to support citizens to participate fully in Irish society. There are too many gaps between the aspirations of policy and how they are delivered and experienced on the ground. The HSE has acknowledged the importance of addressing changes in technology to deliver primary healthcare and acknowledges limitations in the delivery of Aids and Appliances (Wall (2016, p.3), HSE Service Plan 2016, National Policy and Strategy for the provision of Neuro-Rehabilitation Services 2011). The HSE, Department of Education and Skills, and Department of Social Protection all have separate funding schemes for Assistive Technology. These services are supplemented by voluntary service providers, many of whom also fundraise to provide equipment and support services. There is no coordination across the various delivery mechanisms. This makes transitions between school and work (and other life stages) more difficult. Different protocols and application processes also make delivery more costly. There are geographical inconsistencies in how services are delivered on the ground. Much relies on staff knowledge and familiarity with Assistive Technology. Public sector employers cannot avail of the Workplace Equipment Adaptation Grant. There are also missed opportunities for inclusion of Assistive Technology. For example, the Housing Adaptation Grant administered through the Department of Housing, Planning, Community and Local Government, does not consider how Assistive Technology can support people to stay in their own homes and minimise the need for costly retrofitting. It is difficult to ascertain how much State funding is spent on Assistive Technology at present. The HSE funds Assistive Technology through its Aids and Appliances budget, but does not track Assistive Technology spend specifically. This means that Assistive Technology competes with requests for equipment as diverse as beds, wheelchairs, crutches and many other items. Similarly, the Workplace Equipment Adaptation Grant funds both Assistive Technology and adaptations to the workplace. 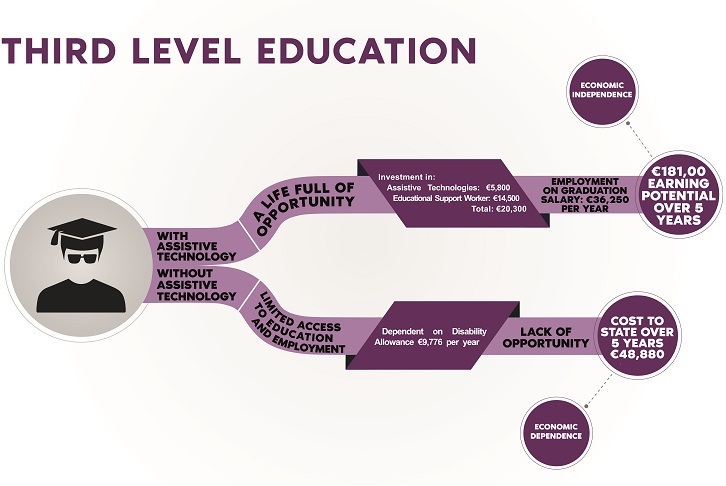 The Department of Education and Skills supports use of Assistive Technology through the network of Special Education Needs Organisers and through the network of Disability Support Services in third-level education. As a result it is difficult to disaggregate spending on technology, training and IT supports. Many people who require Assistive Technology find it extremely challenging to know what they need and to secure it in a timely manner. Furthermore, many who would benefit from Assistive Technology are not even aware of what is available. Individuals cannot apply for funding themselves, but instead must use an intermediary such as their employer, health professional, educator or service provider. Cumbersome application processes are frequently a deterrent. Assistive Technology equipment is “owned” by the school or employer, rather than the student/employee, which hinders educational progression and job mobility. There is no overarching mechanism in Ireland to assess the effectiveness or efficiency of Assistive Technology solutions currently funded by the State. The exception to this is a report by the National Council for Special Education (2016), which indicates that over 70% of students surveyed said that their educational needs had been met by their Assistive Technology. Where Assistive Technology is used well and appropriately, it has great potential to support people across all areas of their lives. People with disabilities, older people and their families have a growing expectation to be included in all aspects of society as a basic human right. Where technology is used well and appropriately, it has the potential to support Irish society to meet many of its obligations under the UN Convention on the Rights of Persons with Disabilities (appendix 3). Article 4.1, for example, highlights the importance of access to Assistive Technology at an affordable cost as a key component of an inclusive society. In addition to the UNCRPD, the Assisted Decision-Making (Capacity) Act (2015) places a legal requirement on service providers to comprehensively enable people to make decisions through the provision of a range of supports and the provision of information appropriate to their condition. Section 3 of The Act cites Assistive Technology as one of the supports that can be used to maximise a person's ability to make and communicate their decisions (p.15 2015). Strains on health and social services all point to the need for new solutions that can complement, and perhaps even transform, existing approaches (NDA, 2012). Recent expenditure on sickness and disability payments has been the highest in the EU (Comprehensive Employment Strategy for People with Disabilities 2015-2024), and the numbers of people on Disability Allowance is rising annually (DSP 2016). Assistive Technology forms part of the suite of solutions that can support people to learn, work, and live independently in their own homes and to contribute to society. The human cost must also be considered alongside the economic. Government policy acknowledges the need to “do more with less“ and the role technology can play in delivering government services (Dept. Public Expenditure Reform, 2015 p.4). This includes offering more government services online. It is critical that we consider the accessibility of such online information to ensure that disabled and older citizens have access on par with everyone else (European Accessibility Act, 2015). Changing demographics pose significant challenges for how society is structured. The numbers of people with disabilities and older people are set to increase, and these trends forecast a significant increase in the numbers of people experiencing vision or hearing loss, memory and cognitive challenges, as well as those experiencing limitations in physical health. We need to respond to this changing profile of Ireland in new and innovative ways that includes Assistive Technology. Current pressures on healthcare services, social care services and social protection payments all point to the need for transformative ways to serve the requirements of a growing population with greater support needs (NDA, 2012). International research indicates that considerable savings can be made over time, which take account of user satisfaction and increased quality of life alongside financial cost (Andrich and Caracciolo, 2007; Bensi 2011). These savings are further illustrated in case studies carried out for this paper (discussed below) illustrating the impact of Assistive Technology in three contexts: education, employment and independent living. Parents of young children with disabilities, young people and adult learners all expect to actively participate in, and reap the rewards of, education. Increasingly, students across the educational cycle, from preschool to university and further education, rely on technology (digital school books, laptops, online learning, etc.) to successfully complete their courses. Screen readers, eye gaze or speech recognition software make mainstream educational resources accessible. A recent National Council for Special Education paper recommended continuous access to up-to-date information on technology developments for students with disabilities (NCSE, 2016). As significant investment is rolled out to support technology-based active learning for all school students (Digital Strategy for Schools 2015), there is a new opportunity to ensure that disabled students can participate on a par with their non-disabled peers. A woman who suffers from sight loss completed her Arts degree, using Assistive Technologies to the value of €5,800. She was assisted by an Educational Support Worker at a cost of €14,500. The total cost of supports over her four year degree course was €20,300. On graduating, she secured a graduate position in an IT firm at a starting salary of €36,250, with a projected income over 5 years of €181,000. Without her degree, she may not have found secure employment, and could have been dependent on Disability Allowance. The cost to the State (over a five year period) would have been €49,000. Technology has transformed the lives of most workers, but it has been particularly important for people with disabilities because it often represents the best way - or the only way - to perform certain jobs that people without disabilities do in other ways . 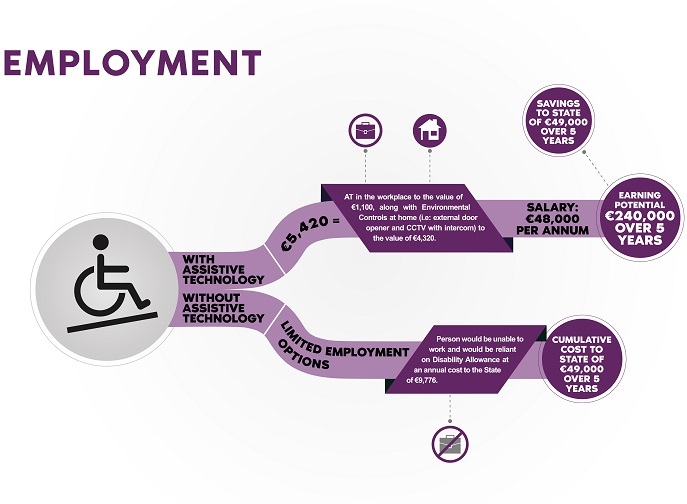 As 85% of disabilities are acquired during working life (NDA, 2005) employment and career progression may be severely compromised if such technology is not accessible. The Comprehensive Employment Strategy for People with Disabilities (2015) recognises that Assistive Technology forms part of the suite of supports required under reasonable accommodations in the workplace. It is considered a reasonable accommodation to provide specific supports for people to move into and retain work (NDA, 2016). 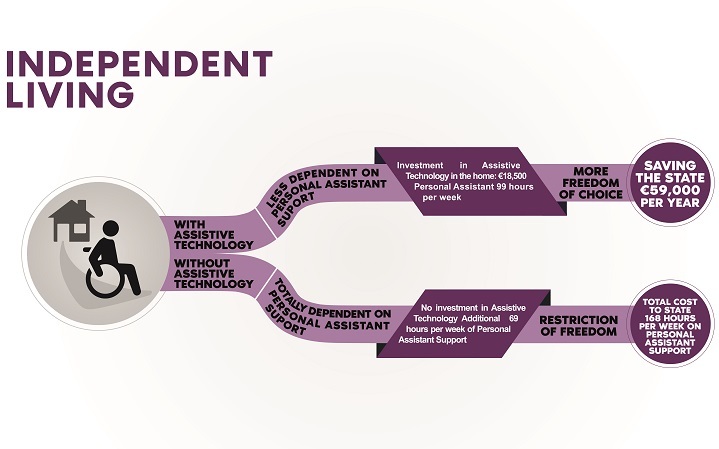 As demonstrated by this case study, for a relatively small investment in Assistive Technology this particular individual is able to take up meaningful employment. One woman who works in education and lives independently uses AT in the workplace to the value of €1,100. She also uses an external door opener and CCTV with intercom worth €4,320 in her home. The total cost of her AT equipment is €5,420. Her salary is €48,000 per annum, with projected earnings of €240,000 over 5 years. If this person was living on Disability Allowance (excluding supplementary welfare payments), the cost to the State would be €49,000 over a 5 year period. “ Universal Design is the design and composition of an environment so that it can be accessed, understood and used to the greatest extent possible by all people regardless of their age, size, ability or disability”(NDA 2016). The Department of Social Protection shared its annual spend (€62,000 in 2014) on the Workplace Equipment Adaptation Grant (WEAG), and the HSE shared its spend on Aids and Appliances across each CHO region with us. In preparation for this report we conducted an anonymous online survey of those who already use Assistive Technology. We had 236 respondents who experience a wide range of disabilities. For further information please see Appendix 1. The unemployment rate amongst disabled people was 30.8%, compared with 19% for the overall population. People with disabilities and older people have a growing expectation that they can live in their own homes and be part of the community around them (Costello and Cox, 2013). Time To Move on From Congregated Settings (2011), New Directions (2012) and Progressing Disability Services for Children and Young People (2011) contain significant commitments to moving people from institutions to the community, as well as reconfiguring day services and creating more equitable access to services for children with disabilities, regardless of geography or diagnosis. All of these initiatives will benefit hugely from harnessing the potential of Assistive Technology. The use of Assistive Technology to promote independence at home can include being able to switch lights on and off, open the front door, or change the channels on the television. These simple freedoms are key to the development and maintenance of independence. A modest capital investment can greatly enhance an individual’s ability to live independently, or with reduced supports. It can also provide the foundation on which participation in education and employment can be built. Such technologies have the potential to reduce dependence on personal assistants for the basics of daily living, allowing care hours to be utilised for social activities and creating time to address more complex personal issues. A woman, who is a wheelchair user, lives in her own apartment. She uses environmental controls to the value of €18,500. She also has 99 hours of Personal Assistant (PA) supports per week. Without her environmental controls, she would sacrifice significant independence, and would require 168 hours of PA supports weekly (i.e. 24/7 support), at a cost in excess of €59,000 per annum. The total cost of her AT was less than one third of the annual cost of round-the-clock Personal Assistant support. Digital literacy is critical to supporting people to interact with online material. Digital literacy is described as “the ability to understand and use information in multiple formats from a wide range of sources when it is presented via computers” (Gilster 1998, p.1). It is as important as being able to read and write in the changing world, and for many, digital literacy development is critically dependent on timely access to appropriate Assistive Technologies. It is an essential aspect of social inclusion (Europe 2020). The way in which resources are allocated is critical to the impact Assistive Technology can have on a person’s life. The Irish service delivery system has been constructed to manage both the allocation (i.e. who is eligible for funding) and also the delivery of the Assistive Technology device. We wish to build on that model and ensure that it is fit for purpose into the future. We also make recommendations designed to ensure capacity raising, research and innovation are supported in tandem with service delivery. We have conducted desk research, run a survey of AT users and commenced stakeholder dialogue to develop a suite of recommendations for further discussion. At the centre of our recommendations, is the concept of the Assistive Technology Passport. The AT Passport describes a way of recording and tracking the equipment, training and funding history of an individual Assistive Technology user, in a way that puts the user at the centre of the service. It could provide a critical resource, both for the Assistive Technology user themselves, as well as funders and support services. It requires an infrastructure that can not only issue passports but can facilitate coordination between multiple funding agencies, and provide for joint procurement processes. 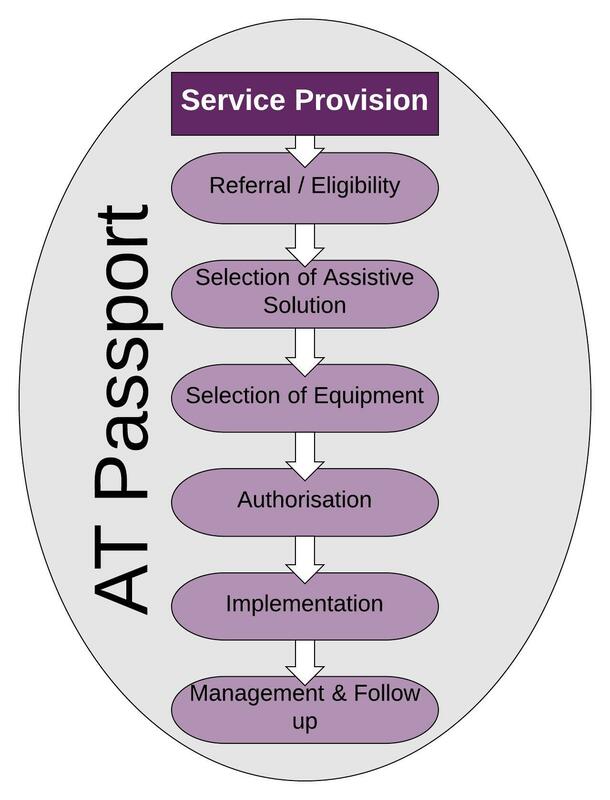 To be successful, the Assistive Technology Passport model needs to be supported and resourced as outlined below. The provision of Assistive Technology needs a whole of government approach. This requires a policy statement developed at ministerial level that supports disabled people’s right of access to Assistive Technology at any age, where there is an identified need. A policy statement could embrace all mainstream and specialist policies designed to support people across education, work and community living. It could address fragmentation and inconsistencies within the current system. A central agency could be mandated with responsibility for ensuring delivery of a comprehensive infrastructure, to include the coordination of the AT Passport process, information provision, and model of service delivery that will serve disabled citizens’ needs for Assistive Technology solutions. We recommend that this process also support innovation and development of Assistive Technology. Principles for guiding such a policy statement are laid out below. We have developed the following principles based on international best practice, informed by the work of the European Assistive Technology Information Network (EASTIN) and their update of the HEART Report (1994). In particular, the HEART study highlighted fragmented Assistive Technology provision and despite the advances since then, Steel and de Witte (2011) report of the enduring importance of the Heart study today, as this challenge remains. We recommend that the following principles be used to guide a policy statement. People with disabilities, long-term illnesses, chronic conditions and older people have a right to access Assistive Technology solutions that support them to live as part of their communities, and participate in education and employment in line with the principles of the UNCRPD. a) Access must be granted regardless of health condition or age. b) Access must be consistent regardless of geographical location. c) Access must be consistent regardless of education, work or living circumstances. d) Funding eligibility must be fair and equitable. e) Information and advice on options must be freely available. Provision of Assistive Technology must be based on a consumer model of delivery. This means putting the consumer at the centre, and supporting them to make choices and articulate their needs as much as possible. a) AT users who can self-assess must be supported to do so, and have their assessment validated and processed. b) AT users must be supported to make active choices around solutions that suit their needs. c) Expert AT users must be trained and resourced to peer mentor other users and/or become a resource to industry. d) Consumers must also be offered the option to choose higher spec equipment and contribute to its purchase from their own resources, as well as input into the aesthetic elements of the equipment. e) The model must give autonomy to the user, or support services to instigate reviews at key life transition points, or as a result of changing health needs. A progressive service must have the flexibility to respond to rapidly changing technologies, and changes in user needs. a) Investment is required to keep up to date with technological advances and ensuring assessors, staff, and AT users keep pace with latest developments. b) Investment in innovation is also a requirement to ensure that mainstream developments are accessible. An efficient service must demonstrate value for money and improve people’s lives. a) It must demonstrate value for money across the lifespan of the person using the technology, in a way that accounts for opportunity costs as well as financial costs. b) It must provide a timely response, particularly during key transition points. c) It must have the flexibility to support new AT users, learners and expert users across mainstream solutions and highly complex AT systems. d) It must deliver a service as close as possible to where people live or work. e) It must provide funding according to need, and take account of capacity to pay or contribute for low cost, readily available items. f) Funding resources must also be pooled together to provide better value for money and better outcomes for people with disabilities. An effective service should be stitched into wider systems of service delivery, and be sustainable, equitable and work for the person using the technology. a) The best use of existing resources, mainstream supports and services within current systems must be utilised, with specialist supports coming into play on a needs basis only. b) Central procurement of equipment can ensure value for money for commonly used items. c) The ecosystem and model of delivery should be monitored for effectiveness, efficacy and efficiency over time. Introduce an Assistive Technology Passport that can act as a single resource to support the process of referral, assessment, selection of solution and equipment, authorisation, procurement and implementation of the chosen Assistive Technology solution. It can be issued by the central co-ordinating Assistive Technology agency and can be retained by the person with a disability or older person. It can act as a single resource to the person and all who interact with them around their technology support needs. It can provide a record of their technology use, and the context in which they use it. It can also record the level of funding to which the holder is entitled. We recommend that a cross-departmental group is charged with the task of examining the feasibility of the AT Passport in the immediate term. A central agency needs to have the responsibility for coordinating different aspects of a comprehensive service. These different elements form an ecosystem of supports. The ecosystem includes issuing of AT passports and central procurement functions. The central agency can also work alongside information provision, service provision and training to ensure that services are as up to date and responsive as possible (see Figure 6). It can ensure that services provide better value for money, avoid duplication as well as gaps in service. The coordinating agency can also ensure that research and innovation are directly linked to user need and developments in technology. It can also perform a monitoring and evaluation function for the entire system. Potential Assistive Technology users, their family and supporting professionals all need access to information and advice on what is available and how to access it. They need up-to-date, accurate, accessible and impartial information and advice on the range of available technologies and funding options. This requires an impartial website, supported on a statutory basis. In addition to a website and helpline, an online loan library would allow prospective users test technology in advance of purchase. A website is well suited to supporting interactive online forums where people can post queries and seek peer advice and support. It could also support online training and user-led videos and how-to guides. This will safeguard against international trends that indicate that 60% of users abandon their technology due to lack of information, assessment or training (Scherer & Federici, 2015). We already have a sound foundation on which to build such a service. The Citizens Information Board’s Assist Ireland web site is a platform that can be to develop. A greater vision for the potential of this resource to provide a comprehensive information service is one of the priorities we recommend for consideration in the immediate term. The Community Hub for Assistive Technology (CHAT), a national network of AT users, AT service providers, researchers and innovators, could also act as a model for information exchange and shared learning. The issue of funding needs to be addressed across three domains: firstly eligibility criteria must be established to respond to both the person's financial means and complexity of Assistive Technology solution. Provision must also be made for central procurement of commonly used items of equipment, and protocols for sourcing off the self as well as bespoke solutions. Flexible funding protocols are required to account for different levels of need. Funding straightforward needs can be met by off the shelf items such as a handheld device. Standard products such as hearing and visual aids work for many while complex needs include more expensive items such as eye gaze systems or highly individualised custom made solutions. The range of complexity is depicted in Figure 7. Different levels of complexity require different levels of funding, which can be met by granting eligibility across four corresponding funding bands. The bands can be adjusted centrally in line with changing costs in mainstream technologies and supports. The funding model should interact with these levels of complexity of solution but it also must take an individual’s financial means into account, particularly in relation to low cost solutions. Assistive Technology may be too expensive for the individual to bear, beyond a specified threshold of reasonable cost. Funding must be based on assessment of need for the Assistive Technology solution regardless of income or age. In instances where Assistive Technology users are granted funding for an off the shelf item, they may receive a direct payment that allows them to source mainstream technologies locally. In other instances, particular items of equipment may be used repeatedly and central procurement can offer the best value for money. This function could be coordinated across government departments by the central coordinating agency. In evaluating the most economically advantageous tender, the long term economic advantage of having the most suitable technology to address need should be explicitly taken into account (DPER, 2014). Existing Assistive Technology expertise within services can work together with the central agency to help source the most effective solutions. In developing a model for service provision, we considered many international models, and experiences in other countries including the UK, Australia and the US. This model is largely informed by the European Assistive Technology Information Network (EASTIN), and in particular, on their updating of the HEART Report (1994) which lays out seven steps to service delivery. A service delivery model for Assistive Technology must be flexible to account for different trajectories. For example, to create an efficient system, it may be desirable to skip some steps where existing need has been established, or where people can effectively self-assess. A person should also be able to trial several Assistive Technology options from an AT loan library before the right solution is identified. The Assistive Technology information website, helpline or peer support services can form the first point of contact for those seeking assistive technology supports. In some instances, these online supports will be sufficient to facilitate self-assessment and self-funding. For others this is the first step towards a referral process. People must be supported to choose the solution that best fits their need, with advice and support. They may have the capacity to self-assess, and access online peer supports via the information website. Specialist assessment services are also required for more complex or bespoke solutions. Assessments need to be carried out as close as possible to where people live. Technology needs must be evaluated by existing professionals within schools, universities and primary care, as well as by professionals in mainstream settings such as Intreo. There are many AT frameworks in use internationally, and all assessors need training in assessments as well as in Assistive Technology. Where specialist expertise is required, this can be supported via referral to a specialist assessor, but in all cases the person themselves or their usual supports should submit the application for funding to a central agency, post-assessment. Assessment criteria should emphasise the need for any Assistive Technology recommended to be fit for purpose. At all times, cost of assessment should be in keeping with the scale of user needs, in order to ensure that assessment resource costs do not markedly exceed AT equipment costs. An appropriate Assistive Technology solution may include equipment, training and IT supports, as well as appropriate review periods. The recommended Assistive Technology solution must put user preferences at the forefront of the decision making process, using a consumer model, rather than a medical model of service provision. User preference must also guide the choice of appropriate equipment that meets their needs. The AT loan library will ensure that eventual solutions effectively meet individual needs. There must be scope to make decisions based on aesthetics as well as functionality. Upon submission of an application to the funding body, which will include a copy of the AT passport, independent assessors will review and make a decision on the application. The application process must also include the right to appeal. Equipment is sourced through the central purchasing process. Appropriate training, and mechanisms for ongoing monitoring and IT supports are put in place as necessary, before the solution is considered operational. Training can be provided by peers, the assessor, supplier, family member or contracted Assistive Technology trainer, as appropriate. Maintenance of equipment, and review periods must be specified and recorded in the Assistive Technology Passport. Reassessment should be triggered automatically after a 3 to 5 year period depending on the complexity of need. The AT user can also trigger a reassessment when they experience a significant change in need, such as changing health or work status. In order to evaluate the effectiveness of the service over time, those with funded supports will be required to engage in a review of the use and impact of the technology every three years. This will facilitate the collection of outcomes data essential to the long term sustainability of an effective national AT service model. Technology is developing rapidly and its future potential is unknown. An effective service must keep apace with these changes as well as resource people with disabilities and older people to articulate their needs and ensure they are embraced at the design and development stage for all technological advancements. Professionals, academics and innovators must all be supported to ensure they consider how to make future innovations accessible. The following recommendations are made in response to this necessity. Assistive Technology is developed for, and used by, people with disabilities and older people. It is designed to maximise their control over their lives. It follows that they must be given maximum choice and control over what technology best suits their current and future needs. They must therefore be supported to make informed choices at a personal level. They must also have the opportunity to inform the design and implementation of the ecosystem through which Assistive Technology is delivered. In addition, they must be given the opportunity to contribute to the development of future technologies. Furthermore, they must have a voice in the development of mainstream accessible technology and contribute to the conversation about how technology is shaping their lives. This requires training, peer mentoring and the development of a cohort of knowledgeable AT users who can support one another; expert users, who can influence the direction of innovation and research. Building competence among service providers requires a national framework to equip them to support AT users in all contexts along with Accredited Continuing Professional Development programmes. Assistive Technology could be introduced as a core subject on clinical and educational undergraduate programmes, and as well as allied health and social care programmes. It should also be promoted across Science, Design and Engineering programmes that include product development and design of technology. As technology is developing at a faster pace than most can keep up with, it is difficult to predict what future developments might be able to do. We need to ensure that mainstream technology is accessible and that people using Assistive Technology can influence and shape future developments. This requires an understanding among mainstream researchers and developers of disabled and older people’s needs, and provision of incentives to encourage development in the area of Assistive Technology. ● Undertake further research to enable us to quantify the extent of current Assistive Technology investment across all government departments and disability agencies. Quantify the nature and extent of Assistive Technology requirement across disability and older people sectors. ● Resource multi-stakeholder learning and information sharing via a community of Practice. CHAT which brings together AT users, innovators, service providers, healthcare practitioners and academics can support this ambition. ● Prioritise user-centred research in technology design, underpinned by the principles of Universal Design. All innovation and research funding targeting the development of technologies across industry must also provide for accessibility. ● Build on collaborations already developed between third level education institutions and service providers. Continue to invest in the research capacity within higher education to inform future developments, including initiatives such as the DOCTRID Programme (All Ireland AT Research Initiative). The ecosystem required for effective service for Assistive Technology is a complex proposition that echoes the complexity of people’s lives and needs. It is something that we must address comprehensively, in recognition that Assistive Technology is a fundamental vehicle to accessing human rights, one that is constantly evolving. This paper has explained why Assistive Technology matters, and sketched out the current system of provision. At present we do not have a coherent ecosystem to address this issue. We have reviewed the experience of other countries, and laid out the key tenets of an ecosystem that can be shaped from the bones of current provision models and reflects the aspirations of Irish policy. It also supports current policy directions such as moving people into community living, transforming day services, supporting people into work and to stay in their own homes for as long as possible, and providing fair and equitable supports through primary care and disability network services throughout the country. We have also highlighted four starting points with the greatest leverage for creating immediate change. These include convening cross departmental groups to consider the AT passport and a supporting infrastructure and conducting baseline research to establish current spend and future need. We also recommend increased resourcing for information provision, as well as investment in the development of a learning community across stakeholders. Bensi, N., Bitelli, C., & Hoogerwerf, E-J., (2011) Assistive technologies and other solutions for independence: cost or investment?. Proceedings of the 11th European Conference of the Association for the Advancement of Assistive Technology in Europe, Maastricht, The Netherlands, August/September 2011: p. 270 – 277. Gilster, P. 1998 Digital Literacy. John Wiley & Son:Canada. Ohline, P., Fagerberg, G., and Lagerwall, T., (1995) Technology for Assisting Disabled and Older People in Europe: The Heart Study. TIDE. A national online AT Survey was undertaken as part of the research process which informs the contents of this report. A total of 236 individual AT users responded to this survey, with many respondents indicating that they experience multiple disabilities. 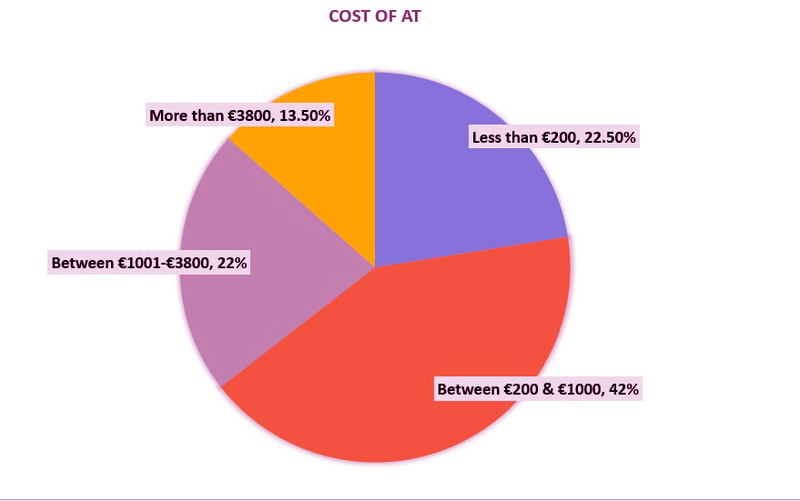 22.5% of respondents use AT which cost less €200 or less, with a further 42% reporting that their AT cost between €201- €1,000. Therefore, over 64% of respondents use technology that cost less than €1,000, with a further 22% reporting that their AT cost between €1001 and €3,800. 13.5% of respondents reported AT costs of over €3,800. These findings dispel the widely-held belief that all AT is expensive. The widespread availability of mainstream mobile devices (smart phones and tablets) has revolutionised access to affordable, accessible technologies. This finding dispels the myth that funding an ecosystem for Assistive Technology provision will pose undue burden on the State. 41% paid for the Assistive Technology themselves. 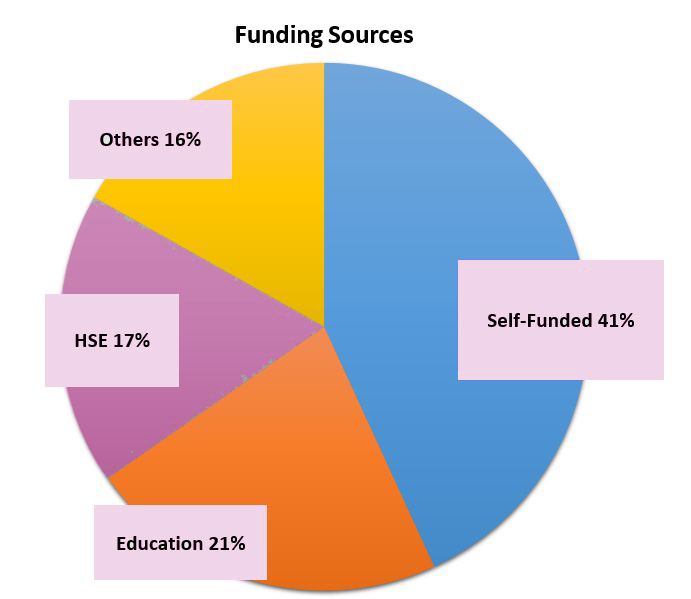 Other service providers formed 16% of funders, with the remainder coming from Department of Education (21%) and HSE (17%). 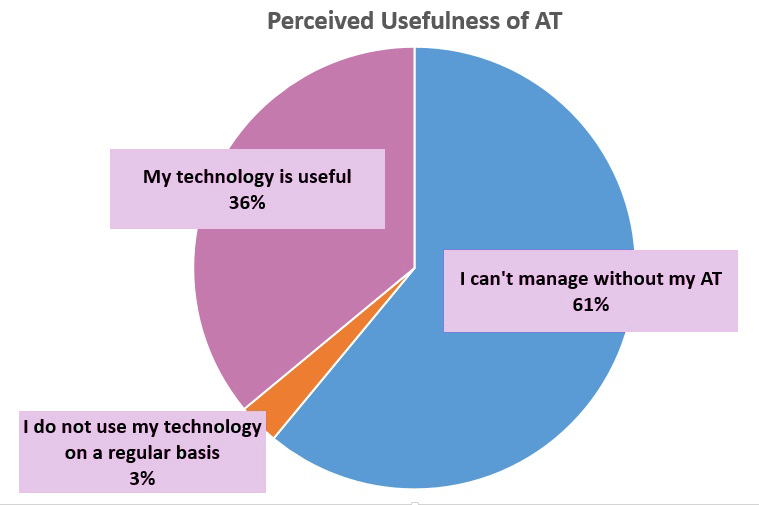 Respondents reported extremely positively on the perceived usefulness of their AT, with 61% reporting that they can’t manage without it, and a further 36% reporting it to be ‘useful’. Just 3% reported that they do not use the AT that they have. AT may be used for a vast range of activities, from sending and receiving texts to navigating the internet, shopping online, reading a document, communicating verbally and opening one’s own front door. Waiting times for AT were highly variable, with over 54% reporting that they received their AT within 3 months. However, 15% had to wait over 6 months and a further 16.4% reported waiting times in excess of a year. 2. How much approximately did your assistive technology cost? 3. How satisfied are you with your Assistive Technology? 4. Where did you get your technology from? 5. How long did it take you to get your technology from your first request? 6. How did you feel about the process of obtaining your technology? Very pleased - it was quick and straightforward. OK - I considered it reasonable. 7. Did you get the training you required to enable you to use your AT effectively? 9. How would you describe your disability? 10. Is there anything else you’d like to share which might increase our understanding of your experience as an AT user? Assistive Technology: Article 4.1: General Obligations, Article 20b, d: Personal Obligations, Article 27(3): Habitation and Rehabilitation, Article 29a (11): Participation in Public and Political life, Article 32 1. d: International Cooperation. 4. People with disabilities have the right to live in the community as equal citizens, covered in Article 19 of the UN CRPD. 5. Article 27 (1), States Parties recognize the right of persons with disabilities to work, on an equal basis with others; this includes the right to the opportunity to gain a living by work freely chosen or accepted in a labour market and work environment that is open, inclusive and accessible to persons with disabilities. We would like to thank the many individuals and organisations that contributed. Allen Dunne, John O’Sullivan, Karl O’Keeffe, Gillian Murphy, Aghna Harte, Claire Cronin,, Professor Annraoí de Paor, Daniel Deering, Meredith Raley, Joanne McCarthy, Ciara Fitzsimons, Simon Hall, Trish McKeogh, Maurice O’Connell, Stuart Lawler, Martina McKenna, Elaine Howley, Kieran Hanrahan, Dara Woods, Moira Fraser, Brendan Lennon, Mark Magennis, David Banes, Christina McCarthy, Nadine Lattimore, Michelle Gaynor, James Brosnan, Eileen Daly, Eugene Callan, Brian Walsh, Sarah Garva Boland, Bernard Timmins, Dr. John Gilligan, Professor Fiona Timmins, Dr. Barry Duignan, Conor Hartigan, Centre of Excellence in Universal Design, NDA, Jacqueline Grogan, Derry Durant, Shauna Humphreys, Alison Harnett, Amy Murphy, Amy Smith, Andrew Costello, Ann Fogarty, Ann Walsh, Anne Murphy, Aviva Cohen, Breda O'Neill, Brendan Lennon, Bridget Boyle, Bridget Doyle, Brian Boyle, Caitrina O'Connor, Carol Breen, Caroline Carswell, Caroline Riordan, Claire Hopkins, Colette Quinlivan, Colin Keogh, Collyn Kenny, Cormac Cahill, Daniel O'Mahoney, Deirdre Madden, Donal Fitzpatrick, Donal Healion, Dr. Aisling Ni Annaidh, Edel Hesnan, Eilin de Paor, Emer Begley, Fiona Duignan, Fiona Maye, Francis Kane, Frank Velthuizen, Gary Lee, Gerard Scully, Gillian Harris, Gillian Quinn, Gretta Fitzgerald, Harriet Doig, Heather Colson-Osborne, Helen Mahon, Hilary Cotter, Isolda O'Connor, Jane McEvoy, Janet ONeill, Jason Gordon, Jennifer Cullinan, Jim Winters, Joe Lonergan, John Brennan, John Horrigan, John Nolan, Josh O'Connor, Julie Tonge, Kate Mitchell, Kevin Hoey, Kevin Whelan, Kris Dhondt, Lisa Domican, Lisa McEvoy, David Dean, Sarah Jane Lavin, Lisa Padden, Mags O Connor, Mags Rogers, Maria McCabe, Marie Cox, Marion Meany, Mary Keogh, Maureen Lanigan, Mervey Bothwell, Michael Foley, Michael Mc Cabe, Helen McDaid, Michelle O'Donoghue, Miriam Kelly, Niall Murphy, Niall O'Hanlon, Niamh McGauley, Patrick Flanagan, Paul Traynor, Pauric Holleran, Rachel Creevey, Reuben Jayawardene, Robert Leonard, Roisin Mulligan, Sandy Brain, Seamus Brett, Sean Loughran, Sean O'Reilly, Shane Keaveney, Sharon Lyons, Sheeona Gorman, Simon Ahern, Sinead O'Sullivan, Sophie Ainscough, Stephanie Lynch, Stephen Cluskey, Suzanne McCarthy, Thomas O'Shaughnessy, Trevor Boland, Zoe Hughes, UCD Innovation Team. All the people who gave their time to participate in the interviews and case studies and all who took the time to participate in our on line survey. The HAAT Model (Human Activity Assistive Technology), The MPT Model (Matching Person and Technology) The SETT Framework (Students, Environments, Tasks and Tools).